The white hill towns and villages in Spain's Ronda mountains are nestled in striking natural surroundings, but none so magnificent as the city of Ronda itself. 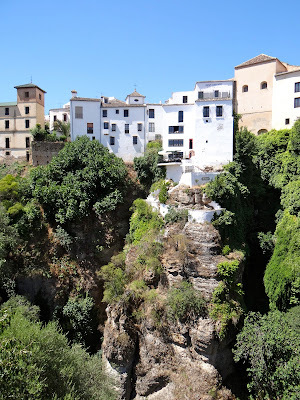 Ronda is built on either side of a dizzying ravine, and the impressive 18th century bridge that spans across it is one of Andalusia's most awesome sights. Puerte Nuevo, completed in 1793. Founded by the Romans, conquered by ancient empires, Ronda finally fell to the Arabs in 713, from whom it received its rich Islamic architectural and cultural heritage. Painted bright white to reflect the hot summer sun, and built on the edge of cliffs and hillsides as a natural defense against invaders, the village offers dramatic scenery and vistas. 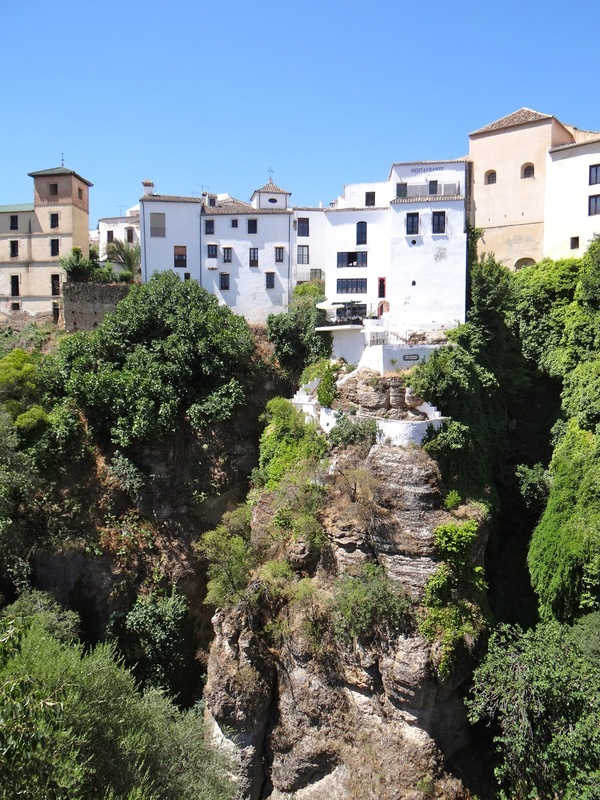 A good place to start your exploration of Ronda is to walk beside the deep gorge carved by the Guadalevin River. Along the paved path are views of the hilly surroundings, handsome old mansions, and several more older bridges across the ravine. Walking trail along El Tajo Canyon and the Guadalevin River. Palacio de Mondragon at the top of the photo. The pedestrian-only Puente San Miguel. The Puente Viejo, also known as the Arab Bridge. At the bottom of the cliffside path are Ronda's 11th century Arab baths, thought to be the best preserved in Europe. The cool, underground chambers and seating for the informational video are a welcome respite from walking in the hot sun. On the south side of the fabulous Puerte Nuevo bridge is the old quarter of town, with narrow cobbled streets, sunny Plaza del Socorro, and charming whitewashed residences. We stayed in a hotel (see my review here) on the "new" side of town because it was cheaper, but I regretted the choice once in Ronda since the old quarter was so much more historical and beautiful. If you're just driving in for a day visit you'll be pleased to know there is an underground parking lot directly beneath Plaza del Socorro in the middle of town. What a beautiful village and the bridges over that ravine are something else! It never ceases to amaze me that construction like this took place long before the machinery that we have today existed. Hard to imagine what building a structure like that was like. Oh, I wanted to visit Ronda on our last trip to Spain and missed it! Thanks for the virtual visit - your photos are great! It is an amazing town, isn't it? What a beautiful town and that bridge! Wow! It's pretty incredible.